Beautiful certificate for 100 shares from the Michigan Copper Mining Company issued in 1915. Lee Degood's Mining Book certificate code MICOMC-4 for unissued certificate - Rarity R-5 (only 11 to 25 known). Since this certificate is issued and cancelled, it is rarer than the one listed in Lee's book. This historic document has an ornate border around it with a vignette of miners working underground. This item has the signatures of the Company's Officers. 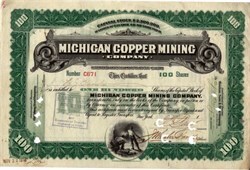 The Michigan Copper Mining Company was organized January 5, 1899, with a capital of $2,500,000. Its location comprises 6,686 acres and includes 4,870 acres of mineral territory, 1,466 of timber and mis- cellaneous lands, and a 150-acre mill site. The main tract is three miles east and west, by four and a half north and south, active operations be- ing conducted at Rockland, northeast of the center of the county. In- cluded in the Michigan location are these three old mines, the Minnesota, Rockland and Superior. It was in the Minnesota tract that the prehistoric pits were discov- ered, noted in the general chapter on copper mining, and which led to the opening of the modern mine in 1847. In one of the pits was a "6-ton mass of copper raised on skids, on top of which grew a hemlock tree having nearly 400 rings of annual growth. Immense masses of virgin copper were taken from the Minnesota, the largest (found in 1856), measuring 12 feet 6 inches by 18 feet 6 inches by 46 inches, weighing 527 short tons and requiring the work of 20 men for 15 months in cut- ting it into pieces small enough for hoisting (See Copper Manitou). From 1847 to its closing in 1870 the Minnesota produced 34,704,668 pounds of fine copper and paid $1,820,000 dividends. The Rockland, ly- ing east of Minnesota, was operated in 1853-70, with an output of 6,210,309 pounds, and the Superior, about a mile east of the present workings, made 567,331 pounds during the periods of its activity, 1856- 69 and 1876-9. The present Michigan mine is a combination of two new mines and a reopened old location, its shafts being sunk on a bed which outcrops a few feet north of the North Minnesota fissure. A few miles to the north- east are the Mass and Adventure mines. The Michigan mine has ten miles of underground workings; employs about 450 men; is opened by three shafts and produces from 1,900,000 to 2,900,000 pounds of copper- annually. Its new stamp mill is about a mile north of the Mass plant at Keweenaw Hay, water being secured through a 1, 200-foot tunnel. A distinctive feature of the copper which is produced by the Michigan mine is its high electrical conductivity, in which quality it surpasses all other Lake Superior varieties.